Workouts are underway. College football teams are taking shape under the hot August sun. Wall-sized coolers of “Falcon Fuel” are being unveiled in a massive ribbon-cutting ceremony … that last one might be an Air Force-only thing. Regardless, weekends for service academy gridiron fans soon will involve the traditional rivalry smack-talk and the more recent tradition of smashing buttons on the remote control, trying to find your team’s game on one of the approximately 73 cable sports networks in time for that 3:30 p.m. kickoff … or was it noon? Or did they play last night? The below schedule (all times Eastern) should help, with a couple of asterisk-inducing caveats: All times and networks are subject to change, a game on an “ESPN network TBD” could end up as an online-only presentation on ESPN3, and our friends at FBSchedules.com provide a great source for in-season updates. Friday, Sept. 4: Fordham at Army, 7 p.m., CBS Sports Network. Saturday, Sept. 5: Colgate at Navy, noon, CBS Sports Network; Morgan State at Air Force, 3:30 p.m., Root Sports (regional). Saturday, Sept. 12: Army at Connecticut, noon, CBS Sports Network; San Jose State at Air Force, 10:15 p.m., ESPNU. Saturday, Sept. 19: Air Force at Michigan State, noon, ABC or ESPN or ESPN2; Wake Forest at Army, noon, CBS Sports Network; East Carolina at Navy, 3:30 p.m., CBS Sports Network. Saturday, Sept. 26: Army at Eastern Michigan, time/TV TBD; Navy at Connecticut, time/TV TBD. 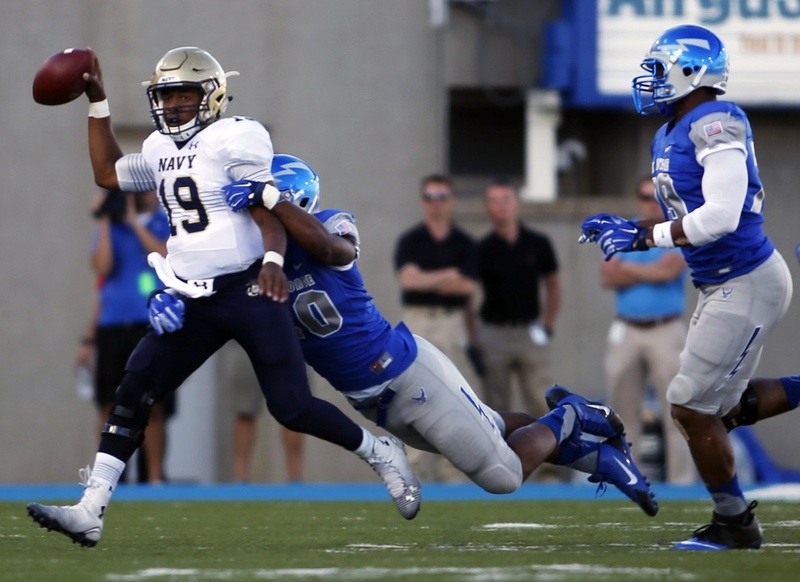 Saturday, Oct. 3: Air Force at Navy, 3:30 p.m., CBS Sports Network; Army at Penn State, time/TV TBD. Saturday, Oct. 10: Duke at Army, noon, CBS Sports Network; Navy at Notre Dame, 3:30 p.m., NBC; Wyoming at Air Force, time TBD, ESPN network TBD. Saturday, Oct. 17: Bucknell at Army, noon, CBS Sports Network; Air Force at Colorado State, 3:30 p.m., CBS Sports Network. Saturday, Oct. 24: Army at Rice, noon, Fox Sports (regional); Tulane at Navy, 1 p.m., CBS Sports Network; Air Force at Fresno State, time TBD, ESPN network TBD. Saturday, Oct. 31: South Florida at Navy, noon, CBS Sports Network; Air Force at Hawaii, 10:30 p.m., CBS Sports Network. Saturday, Nov. 7: Army at Air Force, time TBD, ESPN network TBD; Navy at Memphis, time/TV TBD. Saturday, Nov. 14: Tulane at Army, noon, CBS Sports Network; Southern Methodist at Navy, 3:30 p.m., CBS Sports Network; Utah State at Air Force, time TBD, ESPN network TBD. Friday, Nov. 20: Air Force at Boise State, 9:30 p.m., ESPN2. Saturday, Nov. 21: Rutgers at Army, noon, CBS Sports Network; Navy at Tulsa, time/TV TBD. Friday, Nov. 27: Navy at Houston, time/TV TBD. Saturday, Nov. 28: Air Force at New Mexico, time TBD, ESPN network TBD. Saturday, Dec. 12: Army vs. Navy at Philadelphia, 3 p.m., CBS.